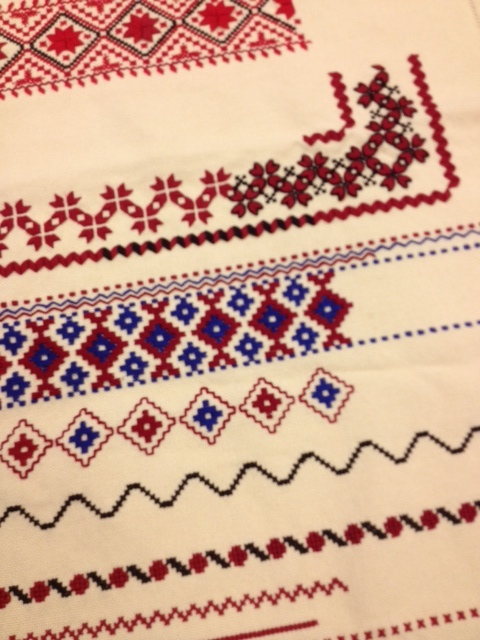 Ukrainian Embroidery Class | NJNA is Blogging! Every Monday morning I get an email from Nordic Needle and there is usually a story about one of their customers. In May of this year the featured stitcher hailed from Astoria, Queens, and talked about the classes she takes at the Ukrainian Museum in NYC. I was very intrigued – my father grew up right down the block from the museum. Although he attended the Polish Church with his father, his mother and sisters attended the Ukrainian Church. And they all spoke Ukrainian at home. I actually got started in counted cross stitch while in college because I had found a piece of cross stitch that my grandmother had done and I tried to replicate the pattern. So I signed up for the embroidery class that started last Saturday. It is an interesting class, running from 1:00 to 3:30. There are about 15 women in the class but it is more of a gathering than a formal class. There were about eight beginners at the class and the teacher sat with us one-on-one. We are working on a band sampler. The more advanced students are working on a number of different projects using other techniques, including cutwork. We beginners are using DMC floss (four strands) on 25-count Lugana. I have to admit I am having a very hard time with it. 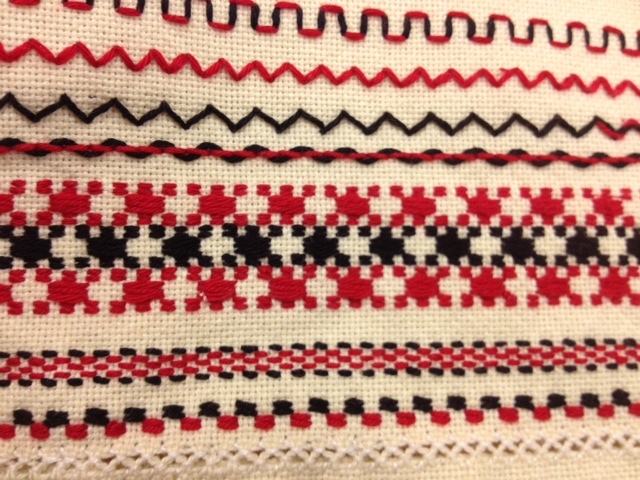 Not because it’s difficult to learn – the first class was all running stitches (essentially darning patterns). But we are working “in hand” without a hoop or frame, the threads are not separated and then recombined, and we are not using a laying tool. This is not how I’m used to stitching! I will have to look closely at the teacher’s sample to see what the threads look like because I can’t decide whether I should just shrug and accept that the stitching is not going to look like I’m used to seeing; determine that the final product when done expertly looks like something that I should strive to achieve; or secretly work a second piece at home on a frame with a laying tool (or maybe just #8 pearl cotton). I will bring in my class piece to the next monthly meeting and ask your advice. In the meantime, here is my progress from the first class. 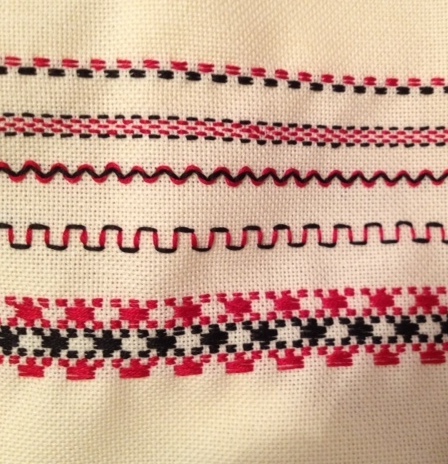 We are using DMC 310 (black) and 321 (red) which are traditional colors in Ukrainian embroidery. I did finish the motif on the fifth band last night but didn’t take a picture before packing everything up for class today. The first band (at the top) is a simple over/under three threads and the second band is over/under two threads. The third band is a “vee” with the red thread woven through it on the surface. I’m not really sure how many bands we complete during this eight-week session. I think it depends on how fast one stitches. Many of my fellow beginners are not needleworkers so we all had a different number of bands completed by the end of the class. My homework was to complete the fifth band although we didn’t start it in class. The teacher told me to go ahead and take a picture of the band so that I could figure it out at home. While I had the camera out I took pictures of the rest of the teacher’s sampler. 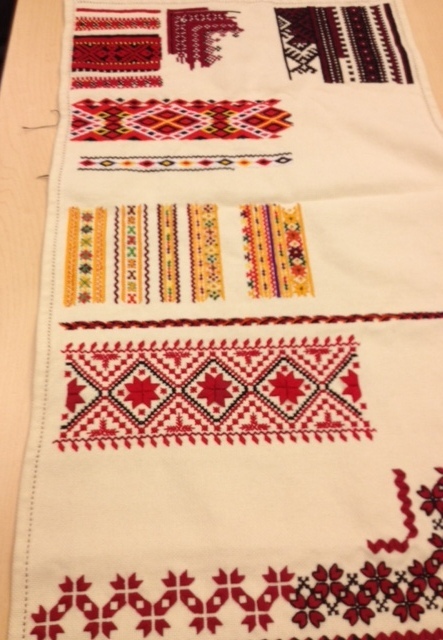 I have been doing some internet research on Ukrainian embroidery and I hope to learn more in the weeks ahead. Now I’m off to my second class! I hope to post about Slava Russki later this weekend, as well as my progress with this class. I hope I don’t start boring everyone! Enjoy your Saturday. I hope you all get lots of stitching done. I think your piece looks great — not sure that you need stretcher bars. The teacher’s sampler reminds me of linens that I used to see growing up in Pittsburgh! Beautiful! Thanks, Rosie. I think I’m going to continue with the piece in hand and see if I can improve the tension on the stitching. It will probably not look like a piece done with stretcher bars and a laying tool but it is a different technique. I don’t think that you will find it difficult to adapt to stitching in hand, Linda. I have not used a hoop or anything else for linen in many years and I have done some laying of threads. I don’t recall how, but I know I have. Your bands look good and I can’t imagine that in something like this the threads need to be laid. To get the 4 strands, do you just remove 2 and leave the 4 intact and stitch? Sue – I hope that I get used to it. My stitching today looked better to me. We did satin stitches so that helped with the tension. And yes, we are removing 2 and leaving the 4.